CIOE 97.5 FM is pleased to host a song writers night event!! Come join us at CIOE radio concert hall for a great night of original music by Lisa Richard and special guest from Nashville Rick Tiger. 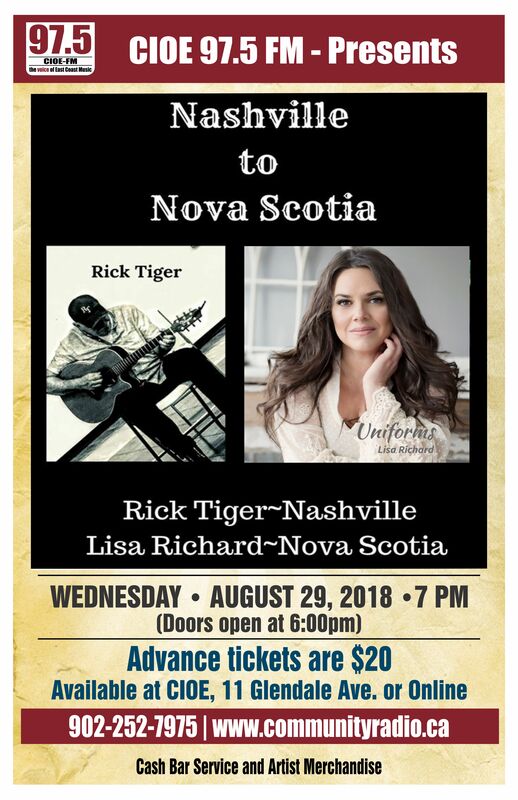 Hailing from New Mills, New Brunswick, Lisa Richard is a talented country singer songwriter who blows away listeners with her powerful vocal range and true passion for music, and thus life. Her vocal stylings have been compared to the likes of Cher, Big Joe Turner and Tracy Chapman. And her genre range extends from rock to blues and country. Lisa Richard began demonstrating her vocal talents at the bright young age of four. She immediately entered the music business by belting out ‘Ballroom Blitz’ for family and friends, charging a quarter per performance. By the time she found herself in university, she began a two-year stint singing harmonies and backup with local band Frank Perry’s Slice in Toronto at such notable venues as the Horseshoe Tavern, Lee’s Palace, and the Opera House. Eventually Lisa returned back east to settle in Halifax. It was not long before she was inspired by Theresa Melenfant and her powerhouse pipes. Lisa worked alongside Hal Bruce to produce her debut EP ‘Tangled Up,’ which was release in January of 2017. The title track of the EP was nominated for Southern Rock Song of the Year at the 2017 Josie Music Awards. While in Nashville for the Josie Awards, she had the opportunity to perform a cover of ‘Jolene’ with Vince Gill and The Time Jumpers (the video of which has reached approximately 125,000 people on social media). The music video for ‘Fisherman’s Daughter’ will be featured at both the 2017 & 2018 New Brunswick Film Festival and is in regular rotation on the Eastlink Network, reaching all of Atlantic Canada. Lisa Richard has performed in Nashville at the George Jones Entertainment Centre and has sang alongside, Vince Gill and the Time Jumpers, Hal Bruce, Shirley Jackson, Matt Minglewood & Carson Downey. Recently, she has returned from Budapest, where she shared the stage with The BlackBirds. Lisa is a 2015 CBC Searchlight Top 10 Regional Contest Winner and a multiple Josie Music Award Nominee in 2017 and 2018 (Female Artist of the Year, Vocalist of the Year, Modern/Contemporary Song of the Year (Uniforms), Outlaw Country Song of the Year (Born to Shine), Video of the Year (Fisherman’s Daughter)). She has been interviewed by radio stations around the globe and currently has stations playing her music in Canada, United States, New Zealand and the United Kingdom. A very meaningful song Lisa co-wrote (Rick Tiger & Jeff Wanex), called ‘Uniforms’ has also been recorded by American Songwriter and Performer, Rick Tiger. It is currently in rotation on Sirius radio.